India’s goddess Durga is the reflection and manifestation of supreme beauty and deadly power, her name being synonymous with the victory of good over evil. Durga takes no prisoners! Benjii and Christopher Simmersbach were born in Germany and grew up in Thailand, Mali, Senegal, USA, Italiy etc, documented in the award winning ZDF/ARTE documentary “The Big Pink”, 1996, by Kolin Schult (Adolf Grimme Preis). The Film is based on Super 8 Material, Benjii’s and Christopher’s Mother, Monica Neven Dumont, known as ‘Maomi’, shot throughout their childhood years. The Durgas’ current line up consists of Benjii and Christopher Simmersbach, with Török Gabor on Drums and Katy J on Bass since 2007 with Alex Czerny on Organ/Piano. April 2004 European Tour Benjii and Christopher join a group of mostly San Francisco singer/songwriters (Nate of Nate Denver’s Neck, Trevor of Lazarus, Christian Pallin from Sweden, and Mark Edwards and Jeff Ray of Radius) on a European “acoustic” tour, co-organized by the Mission Creek Music Festival (www.mcmf.org) and The Durgas. From Budapest, Hungary to Helsinki, Finland. The Durgas perform a series of concerts in Thailand, having been invited to perform during the XV Internationalen AIDS/HIV Conference, Bangkok. Amongst the series, they play the Com.passion concert, organized by the Goethe Institute, as well as at the Mercy Center, a concert endorsed by Nobel laureate and former President of the Czech Republic Vaclav Havel and Buddhist activist Richard Gere, organized inside an AIDS hospice in Bangkok’s largest slum community. During their stay in Thailand,they also perform in Mae Sot, at a school for Burmese orphan children as well as at the Head Quarters of the ‘All Burma Student Democratic Front’ (ABSDF). They contribute to the fundraising efforts for Matt Gonzales during his campaign to run for Mayor of San Francisco in 2004. They also help fundraising for Ross Mirkarimi, running to replace Matt’s position as supervisor for District 5. They record the soundtrack to internationally acclaimed film maker Marcell Ivanyi’s new short film ‘Ballada’, released in spring 2005. August 2005 Transylvania The Dugas organize a return tour through Transylvania. Reconnecting with people from the times of A Subtle Plague, when they first toured Rumania. Again they tour Europe and the United States twice. January 2007 Hawaii After 4 years, Benjii and Christopher meet their brother Patrick on Hawaii, who had booked a tour for The Durgas on Oahu and The Big Island. During their stay they also perform at Kanu O Ka’Aina, Weimea, Hawaii’s first native designed and controlled public charter school. May, June, July 2007 On their European Tour, they support the German foundation WeltKinderLachen by promoting the foundation’s projects and collecting donations. The Durgas finally find supporters to release their debut album ‘Back to the Start’ (Releasedate: 18/01/2008) in the Berlin-based label Cannery Row Records. 2004, 2005, 2007 They give concerts and workshops at the Pestalozzi Kinder- und Jugenddorf, Wahlwies, Germany. In 2007 they hold a three-day-long music workshop for 17 kids from the village and surrounding regions. Over the past years The Durgas tour extensively throughout Europe and the US, and perform to support non-profit organizations such as *Food Not Bombs *Rock against Cholera *Rockers ont du Coeur (an organization distributing Christmas toys to children in need) *C.E.S.T.A (Cultural Exchange Station of Tabor, CZ) *Club Komotion and Studio 4 in San Francisco, *various youth organizations in the US and Europe. 2011 The Durgas participate in a Kaukasus Ralley, beginning in Hungary, through Bosnia, Montenegro, Kosovo, Albania, Greece, Turkey, Georgia, and Nagorno Karabakh, until Yerevan, the magnificent capital of Armenia, documented by a film team. “Benjii and I spent many years of our childhood in Africa – Senegal and Mali (West Africa), and Tanzania (East Africa) – where we have witnessed first hand the effects of poverty, AIDS, as well as other terrible diseases on its population. As we grew up, our parents were constantly involved in international organizations—from building nutrition programs to building schools—emphasizing community participation and working toward world development. This gave our family the fortunate opportunity to travel throughout Africa, Asia, and the Middle East. In addition, it gave us an exposure to the level of social and economic problems in the world. Benjii, Christopher and Patrick Simmersbach with Magnus and Maurus Fleischmann (Drums and Bass) of Assassins of God, Hedonist. Benjii (formerly bass player/singer of A Subtle Plague) switches to guitar and becomes singer of A Drastic Measure. They record ‘High Frequency Recalibration’ (1999, self release) followed by another European tour in 2000. Shortly after, Magnus Fleischmann and Patrick Simmersbach move to Portland, Oregon and Weimea, Hawaii to start families. A string of changing drummers follows. Jonathan Levy (of A Subtle Plague) rejoins the band on keyboards. After changing bass players, Jonathan Heine from Berlin joins the group. In 2003, Jonathan Levy leaves the band. 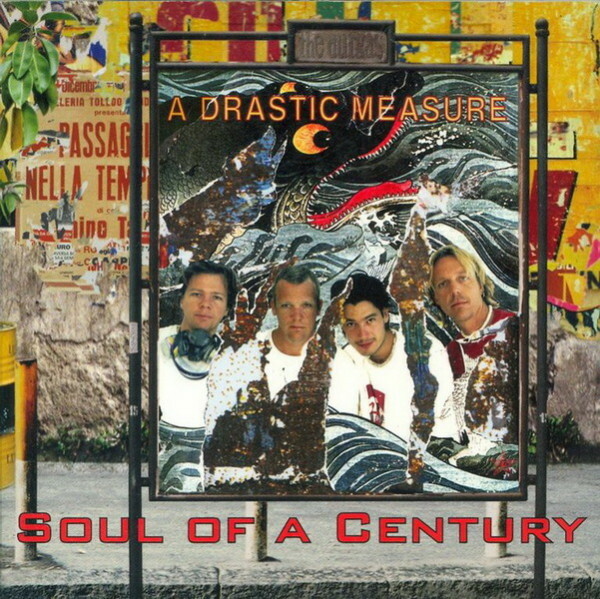 2002 A Drastic Measure record ‘Soul of a Century’ in San Francisco, engineered by Desmond Shea at Kevin Ink’s The Studio That Time Forgot. It gets released in the spring of 2005 and was produced by Fred Vidalenc (ex-bassist of Noir Desir) in the Brittany, France. Among many guest musicians, the album features Michael Franti of Spearhead on vocals, Dan Carr of Preston School of Industry, The Court and Spark on bass, Tom Heyman of Go To Blazes, The Court and Spark on slide guitar, as well as Analucia DaSilva of A Subtle Plague on vocals. April and June 2003 They participate in a series of successful concerts in Mitrovica, Kosovo as part of the ongoing United Nations (UNMIK) peace initiative and reconciliation efforts between the Kosovo-Albanians and Kosovo-Serbs. Christopher Simmersbach (percussion) meets Pat Ryan (Vocals) and Peter Johnson (guitar) at Bard College in Upstate New York. They launche their first band Peace Love and Anti-Intervention, which metamorphoses into A Subtle Plague in 1984. Soon A Subtle Plague opens up for national acts like Sonic Youth, The Minutemen, Firehose, The Feelies, Dumptruck, Big Dipper, among many others. 1985 Adam Yauch of the Beastie Boys records their first demo. 1987 Benjii Simmersbach becomes bassist in A Subtle Plague. The Band members agree to fully dedicate themselves to A Subtle Plague. They relocate to Philadelphia, a year later to San Francisco. 1988 Christopher’s and Benjii’s brother Patrick Simmersbach, joins on Leadgitarre, as well as Analucia DaSilva on vocals. 1989 They record their first album Inheritance, produced by Tom Watson of Slovenly in Los Angeles. Released on Heyday Records. Followed by their first US Tour. 1992 The band gets invited to Germany to perform in a series of concerts that then get edited into a film, ‘The Big Pink’, directed by Kolin Schult (produced by Lichtblick, 1994). Continuous European Tours follow, with an average of 125 concerts a year. They share stages with bands like Iggie Pop, Lou Reed, Chumbawamba, The Jesus Lizard, Sister Double Happiness, Cement, Mudhoney, Dirty Three, Noir Desir, Sly, Drive Blind, Burning Heads, The Thugs, Les Mush, Condense, H-BlockX, Blumfeld, Notwist, The Jakobites and many more. 1997/98 When Analucia DaSilva and Pat Ryan decide to leave the band, the other band members continue as A Drastic Measure.